I am off visiting the family in Atlanta, so you may have noticed my postings have been sporadic. But, as they have taken a little trip to Target for school supplies, I thought I would try to get in a Saturday post. I have always loved the Shaker influence in decorating. 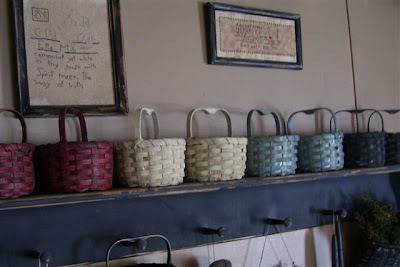 There is nothing better than their simple pure lines, and as we have a Shaker Village at Pleasant Hill in Kentucky, I like to visit and and enjoy lunch at the Shaker Inn as often as possible. So here is a quick look at some Shaker decor. I'm thinking that most of us would not want to live quite as austerely as the Shakers did, but their timeless furniture and accessories are beautiful additions to most any decor. Have a great Saturday. I am getting ready to ooh and aah over some new backpacks. great photos & inspiration Laura! I love the simplicity of the bedroom, even if I could just never manage it! =0) I recently picked up an antique shaker box for my antique booth. I just love the amazing patina!